The Bureau of Land Management (BLM) and the United States Geological Survey (USGS) have partnered to create the Surface Disturbance Analysis and Reclamation Tracking Tool (SDARTT). SDARTT is to be the national repository for and analysis tool of disturbance data pertaining to public land operations for the BLM. Users will upload disturbance and reclamation data to SDARTT to map, analyze, and generate data reports. Spatial data will no longer be stored in the various current (or future) Data Management Systems (DMS). Instead the various DMS applications will have the ability to direct their users to SDARTT for data uploads, and the DMS applications will have access to the ever growing national pool of data. 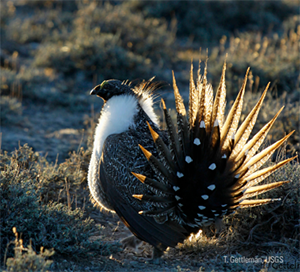 The BLM manages much of the best remaining sagebrush habitat for the Greater Sage-Grouse. As part of an unprecedented effort by dozens of partners across 11 western states, it has developed land use plans to conserve this habitat. These plans benefit not only the Greater Sage-grouse, but some other 350 other species of wildlife that rely on the sagebrush sea, and the many, many people who depend on it for their livelihoods and a source of recreation. Where do I find the SDARTT User Manual? To find the SDARTT User Manual click on the Resources tab and then click on the “New SDARTT User Manual” link. How do I register to use SDARTT? How do I choose which role to register as? To determine whether to register as an Approver, Verifier, Editor, or Reader see the associated descriptions in the To Register section of the SDARTT User Manual. The download link for the SDARTT User Manual is located under the Resources tab. How do I log into/launch SDARTT? To log into/launch SDARTT click on the Launch Tool button above and login using the username and password you registered for SDARTT. You can also copy the login URL into a web browser: https://blm.sciencebase.gov/sdartt to access the SDARTT login page.